The idea for the Spirit of Big Five Foundation arose organically over time, and grew out of the guiding philosophy of Big Five Tours & Expeditions, a leading luxury tour operator. Since its inception in 1973, Big Five has been committed to responsible travel that fosters the preservation of our wildlife and cultural heritage and, equally important, support for the well-being of local communities. Formally launched in 2007 as a 501 3c nonprofit organization, the foundation seeks to broaden the scope and depth of support to conservation, cultural preservation, poverty alleviation, education and healthcare in Africa, Asia, Latin America and the South Pacific. Spirit of Big Five Foundation is funded entirely by the Sanghrajka family, the founders of Big Five Tours & Expeditions. But we have found that many of our guests return home from their journeys also inspired to make a difference; to be part of the solution. While we do not request donations, guests and others are welcome to donate to the foundation’s active projects. And to honor that sense of community and dedication to making the world a better place, the Spirit of Big Five Foundation guarantees that 100% of any donation made goes directly to the chosen project(s). We are proud of the projects we support around the world, demonstrating how tourism can also help protect nature and sustain the well-being of local communities. 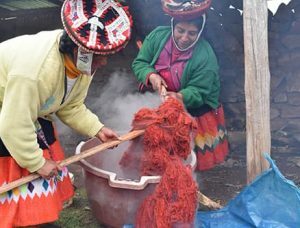 Our newest project is a nonprofit women’s cooperative called Awamaki, which connects indigenous artisan women to markets outside their remote Quechua villages in the Andes. For more about this and other great projects, click link above or Click here. If you are a nonprofit organization seeking funding from our foundation, please see “How to Apply.” Thank you for your interest in the Spirit of Big Five Foundation.